On the Farm, Off the Hook! | I'm Gonna Cook That! On the Farm, Off the Hook! Have you ever watched someone bliss out over compost? I mean, really just go into an absolute state of eyes closed, face glowing, pure happiness talking about decomposing food scraps and coffee grounds and egg shells? Let me tell you, it’s a beautiful thing. I imagine that’s kinda what I look like when I get all wound up about some food thing. But then again, compost is also “some food thing.” And when you’re sitting at a table full of people who get that, the urge to stand up and do some sort of happy dance while yelling at the top of your lungs, “I HAVE FOUND MY PEOPLE!! !” is overwhelming. What the heck am I on about? Heroes Like Us, Yelp Denver, and Rocky Mountain Farmer’s Union, along with some great local food and drink people including Stranahan’s Colorado Whiskey, Infinite Monkey Theorem, Upslope Brewing, DiFranco’s, The BSide Denver, and The Inventing Room, got together to put on the third in a series of four dinners hosted by local community farms. The proceeds from each ticket sold go right back to the host farm, and once you’ve actually eaten dinner just feet away from the farm where the produce has been growing, and just chairs away from the people who have been growing it, you sort of start to feel warm and happy all over. 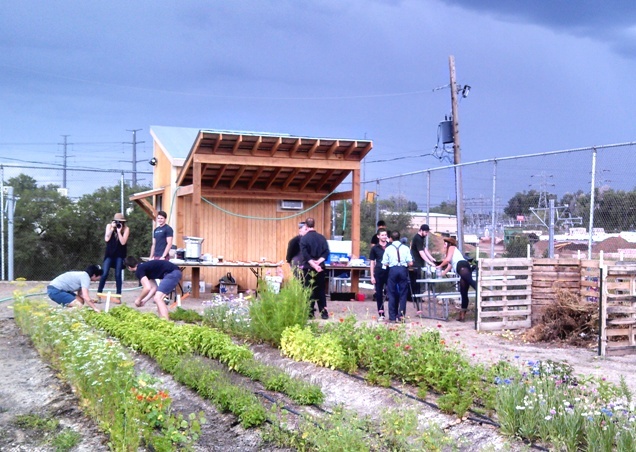 The August dinner was hosted by Sprout City Farms at Mountair Park Community Farm in Lakewood. This farm has been at the park for a year, and has 35 CSA members who buy shares in the harvest and get a delicious box of whatever’s ready on a regular basis. As you can see, there was some weather coming, but before the worst of the rain storm blew through, we got a chance to walk around, check out the farm, and watch the chefs from DiFranco’s and The BSide work their magic with nothing more than their knives and some single burner camp stoves. Did I mention that the produce we enjoyed at dinner came right from this farm? I know that if it had been me cooking, it would have been impossible to keep me from wandering around looking for just one more wonderful, fresh bit of something to add. I wasn’t the only one feeling that way. I witnessed more than a few impromptu trips out to that beautiful herb bed (“Hey! They’ve got cinnamon basil!”) for some last minute touches. Speaking of dinner, check out this menu! I can honestly say there wasn’t a single dish that didn’t make my mouth happy. What made me even happier, if that’s possible, was the conversation at my table. The first three courses were served family style, which, even if we hadn’t already been chatting up a storm (pun only sort of intended), would have pretty much forced us all to get to know each other. Nothing like a big platter of braised pork to get the whole table buzzing! But really, although the food in front of us definitely created some conversation, it was the stories from the other folks at my table that really made my inner people junkie come out. To my right was Liz, a shareholder in the CSA and also a member of the Community Advocacy Committee. We talked about urban homesteading, and her family’s long history of making the most of what’s available locally, be it here, or in her home state of Oregon. She was quick to correct me when I slipped up and call the Farm a “garden,” and rightly so. A farm serves a community, just as the one at Mountair Park does, and every single member and volunteer at this farm beams when they talk about their involvement. Liz’s enthusiasm for homesteading, for utilizing what’s in season locally, and for helping anyone who wants to learn how to create meals worthy of all that beautiful produce, was infectious. Without a moment of hesitation I was ready to dig in and help her get the message out. On my left was Emily, a teacher at Molholm Elementary (just a few blocks away from the farm), and her mom Kay. Emily told me she hadn’t ever really done much cooking, and was still learning how to cook with the goodies she gets in her CSA box. But, until she became a member at the farm she had never really been all that excited about trying. Now, if she gets a veggie she isn’t familiar with, she knows advice is just a phone call away. The staff and volunteers at Mountair Farm make themselves available for questions just like Emily’s, but also work proactively to organize classes and workshops to help their members stay connected to the farm and the food. If you have access to a community farm, I can’t recommend enough that you find a way to get involved. Whether it’s by buying shares in the CSA, taking classes, volunteering, or any combination of those things, there’s absolutely nothing like being a part of something that is greater than the sum of its parts like a community farm can be. I’ve never met a farmer who wasn’t genuinely happy to share their knowledge, and there’s something kind of magical about being face to face with the person who grew your dinner (or lunch, or breakfast). There’s nothing like putting your own hands in the dirt to help you learn about where your food comes from, and why it’s important to pay attention to how its grown and who’s growing it. If you’re in the Denver area and you want to get in on this warm, fuzzy feeling, I recommend starting with the September On The Farm, Off the Hook Dinner. Ticket’s are $65, and even if all you’re going for is the food, it’s worth every penny, but I’ll bet you a dozen homemade biscuits and a jar of jam that you get way more out of the experience that just a happy belly. All the details are here. It’s the last one for the year, so don’t miss out! What a cool event! I wish I could be in Colorado for it. Yep, that’s totally what you look like when you get wound up about a food thing!